The Invoicing System for Excel is a billing and invoicing software solution powered by invoice templates and an Excel add-in. 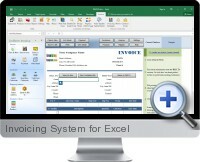 It seamlessly integrates with Microsoft Excel providing an ideal billing solution for small to medium size businesses. Create invoices in a what you see is what you get invoice template. Manage customers, products, invoices and payments easily. Design custom invoice templates with familiar Excel functionality. For example, set date, currency and font styles just by formatting a cell. Customize the invoice form layout by dragging and dropping. There are no VBA macros. All invoices available can be unprotected, enabling customization of the invoice including (but not limited to) creating macros if needed to simplify repeated tasks. Unlimited number of companies and databases. Networking - share invoice data with colleagues over a network. Design a billing system at the database structure level. The Custom Field feature allows to add custom fields and columns to the existing invoice. Includes a completely free invoice template, which can be used stand alone to create and calculate invoices.